December 23,2010 Jerrit C. & Sydney & Hutch Have a Merry Christmas Present on Big Lake!!! December 23,2010 Jerrit C. & Sydney & Hutch Have a Merry Christmas Present on Big Lake!!! What a great Family Trip for these guys to Limit Out on 3 to 8 pound Redfish on Gulp Shrimp on Lake Calcasieu! They said it was their best fishing trip ever! And can’t wait to be back next year !!!! 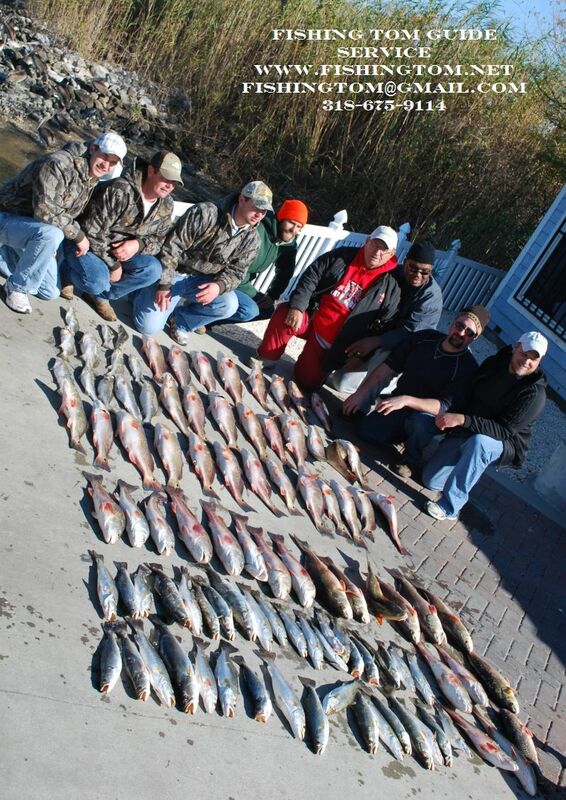 December 18, 2010 Jeff R. & Friends Load 2 Boats with Nice Lake Calcasieu Reds & Trout!!! 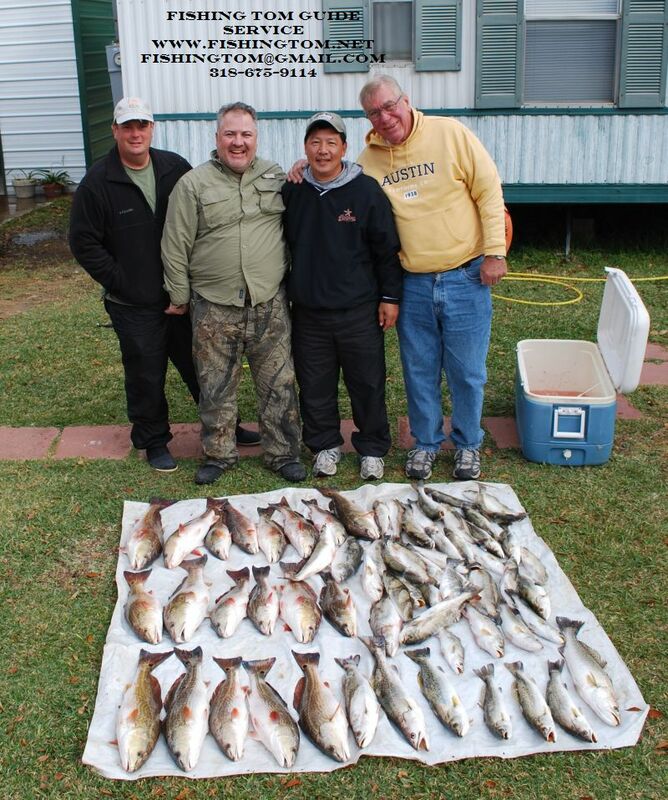 December 18, 2010 Jeff R. & Friends Load 2 Boats with Nice Lake Calcasieu Reds & Trout!!! 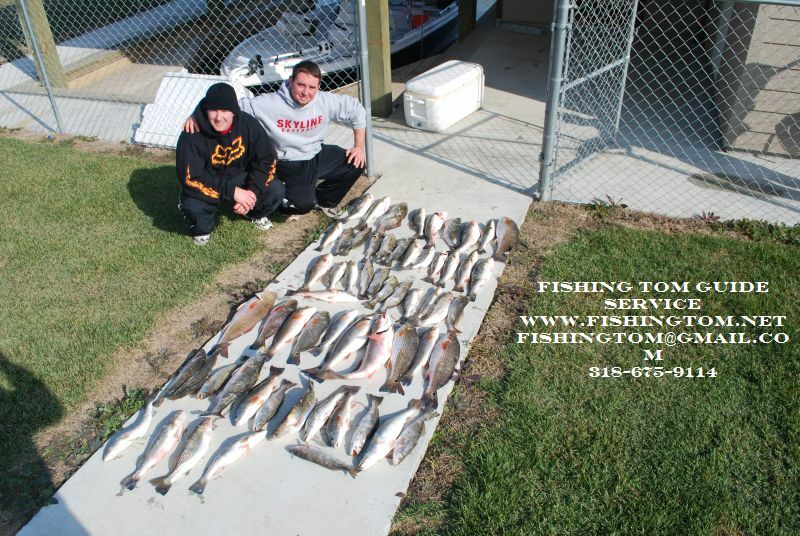 We had 50 Reds at 9 am on Gulp Shrimp then headed North to put 50 Nice Big Lake Trout aboard Also!!!! What a Day! Several of the Guys said it was their Best Trip EVER!!!!!! December 10, 2010 Trip #7 for Lieghton M. This Fall & Planning #8!!! December 10, 2010 Was the Seventh visit to Lake Calcasieu(With Captain Tom!) for Leighton M. & Uncle Hank and first for his Brother in law Tracey in from Idaho. We caught over 75 Fish today but these guys just wanted a few for a Redfish Grill on the Halfshell so most of the Big Lake Bronze Beauties were released to fight again. Uncle Hank had the Hot Rod! 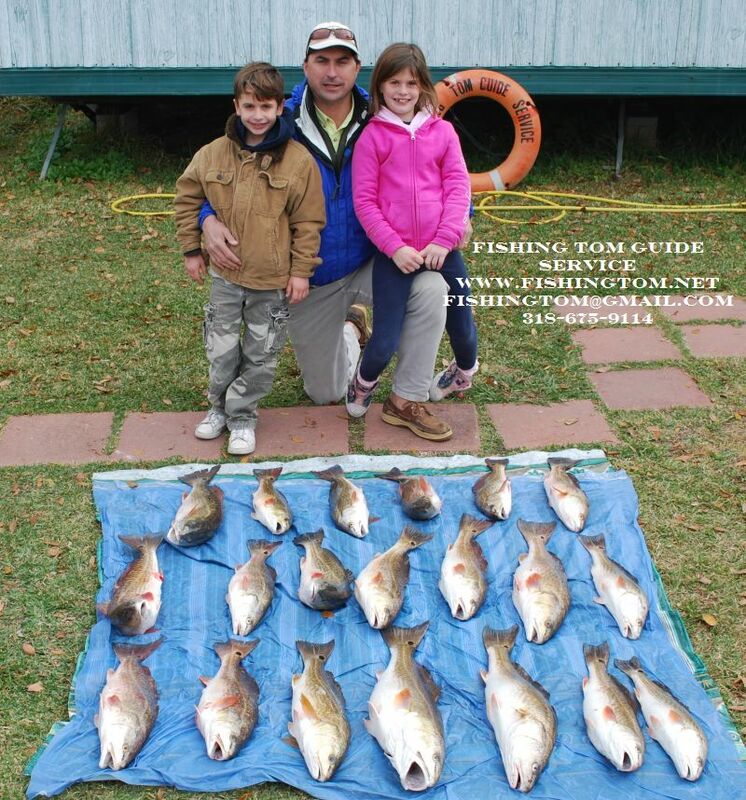 today and for 84 (His Birthday was yesterday) He easily outfished his much younger partners! He was wore out and opted for a nap instead of another photo! 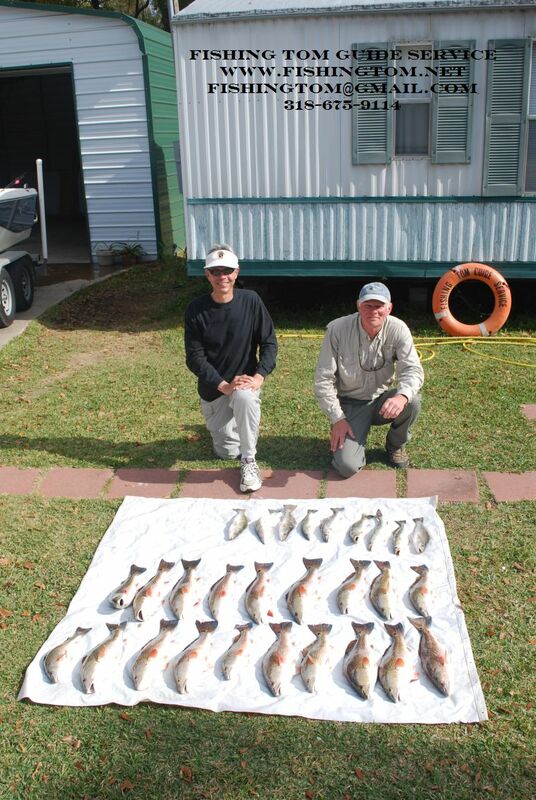 December 9, 2010 Jonathon W. & Brother Nick Limit on Nice Calcasieu Trout & Reds by 10:30!!! 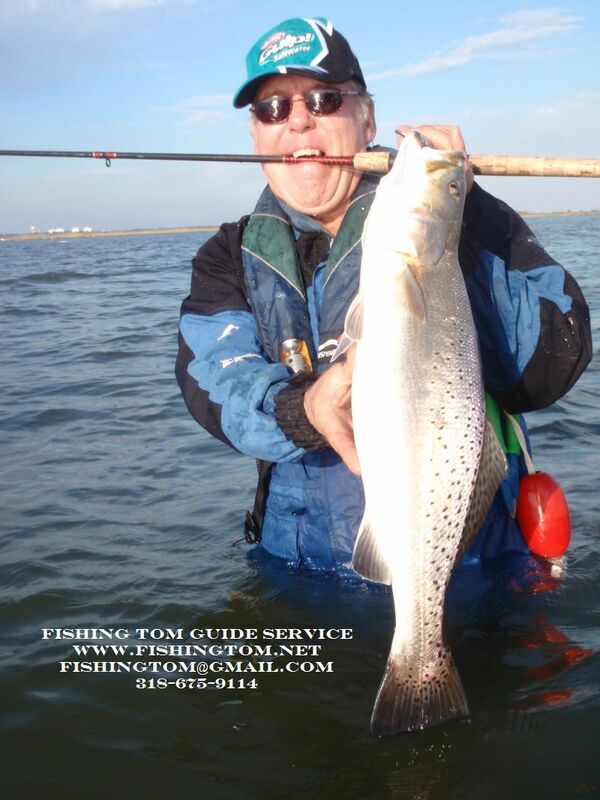 December 9, 2010 Jonathon W. & Brother Nick Limit on Nice Calcasieu Trout & Reds by 10:30!!! It was on from first cast to the last at 10:30. Gulp under a cork for a limit of Big Lake Specks and Gulp Shrimp on a jig for a nice limit of Big Lake Bronze Beauties!!!! December 9, 2010 Howard L. & Friends Catch a Bunch on Big Lake!!! December 9, 2010 Howard L. & Friends Catch a Bunch on Big Lake!!! Gulp Swimming Mullet under a cork loaded the boat with nice trout and 3″ Pearl Gulp Shrimp Filled a second cooler with Lake Calcasieu Bronze Beauties. December 7, 2010 Lake Calcasieu Wade Fishing Season Has Started!!! December 7, 2010 Lake Calcasieu Wade Fishing Season Has Started!!! The Birds are still working but the Big Girls on Big Lake are on the move! Corkies, Catch 5’s and Top Waters are starting to produce in the shallows. We had 6 fish over 5 lbs today. This one tipped the scales at 6 lbs. 6 oz. Call me at 318-675-9114 and lets catch a Trophy!!! !